eat, drink & be vegan: Some Days Call For Soup! Some Days Call For Soup! What a day! First, we had snow. In Vancouver. In March. I drove my older daughter to an activity - it was cold and mucky, and a little dangerous driving (it IS Vancouver, people don't "get" snow). Then I picked up groceries with the baby tantruming. She is 15 months... early it seems for tantrums... sigh! After s-l-o-w-l-y driving back home, my older girl says "mommy, Sarabi (cat) threw up on the couch and the floor". Lovely. Anyhow, this is definitely a soup night! 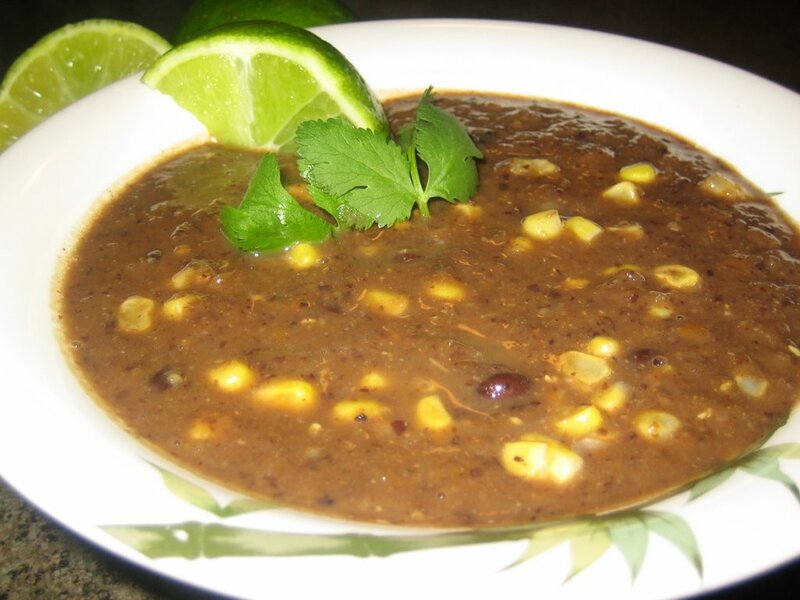 I have some leftover Chipotle Corn Black Bean Soup from Vive le Vegan! Easy to prepare but with complexity in flavor... and although is has chipotle, it is not a spicy soup. I use Tabasco Chipotle Sauce in recipes where I want a hit of chipotle flavor. It is inexpensive, convenient, and you can use just a little for a hint of smoky spice, without the heat. Of course, if you want it hotter, add much more! Now, if at all possible, serve this soup with fresh lime wedges. Squeeze a little in each bowl, the flavor combination is sensational! Oh, and also sprinkle on some fresh cilantro (if you like it)! What a wonderful soup for a crazy day in Vancouver. It is warm here (70 degrees) but soup is always soooooo good! Your book sounds fab! I think I should buy a copy as my next cook book! Hey Vicki!! 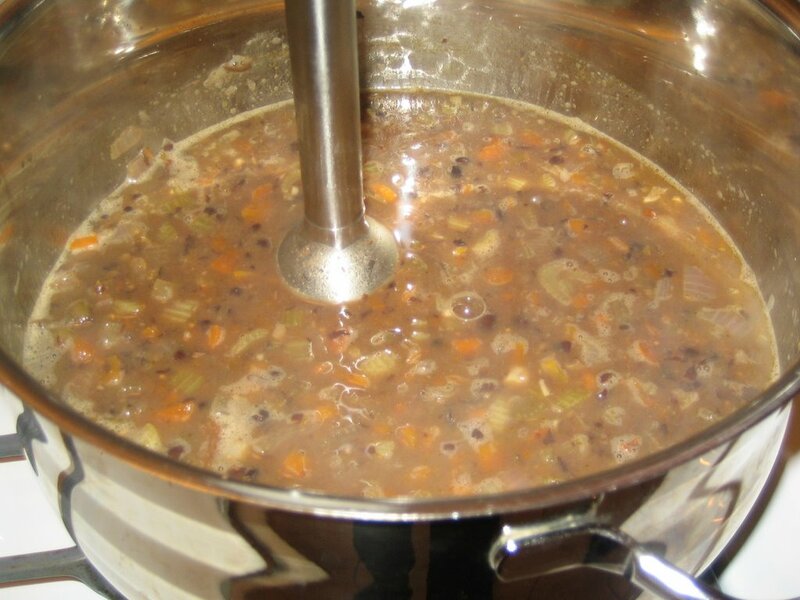 Well, you cannot imagine how many times while making this soup I was thinking "um, can we have black beans"! Sorry for getting that idea into his head right at supper hour! Well, you can always say "sure, hon, we can have it... when should I be back with the kids for dinner?" It's actually quite easy to make, but you might want more than a 1/2 hr's notice to do so! :) "ummm, black beans"... still makes me laugh! Hi veggie goddes. Please, don't rub it in!! :) It had started to warm up here and the buds were coming out on our beautiful cherry blossom trees, and then WHAM, this bizarre, very uncharacteristic, change in weather. I know we will be back to some nice weather by the weekend... but still, brrrr! (I am so spoiled with the weather)! Cilantro? You know I do! I have been eyeballing this recipe since I got the book! I have been looking everywhere for Chipotle sauce and didn't think of Tabasco. I did find one yesterday made by...El Paso, I think??? I posted about my Kumquat experiences on my blog already today...but will be posting other posts later. I'll be back soon! Hope your weather is better today! Black beans are my favorite bean of them all! My chipotle hot sauce is not 'Tabasco' brand, but it's really good as well. I love the smoky flavor--it's not too spicy. Looks like your put you imersion blender to good use again. That's on my wish list--right after a food processor. Just wanted to say I've been reading your blog for a few weeks now and enjoy it a lot. Thanks for all the ideas. My son just turned 15 months on the 7th and is also starting with tantrums. So you are not alone! Hey Dreena, I finally tried that Roasted Tomato Bean Stew from Vive, and it was excellent! Mine looked just like the picture. Really great combo of tastes and textures, and super easy to make. Am thinking about the quinoa hummus casserole next. But, this black bean soup looks fab too, and we are still in a snowy month here, so there will be a good time for it, for sure. Thanks again for the great blog! I would have loved to see that with a coat of snow! With a 14 mo. old and a 2 yr. old, I could totally relate to your tantrum story. I was up at 2:30 in the morning (then again at 3:30) with a screaming child as I was nursing the other one! I was looking at this soup's recipe earlier, but went with another curry dish- (chickpeas, sweet potatoes, etc.) Sorry, don't have the book handy to check the name. I didn't follow the recipe to the T, no apple, etc., but it still was yummy! I responded a little bit more in comments. I thought I was going to post more today but I am having fun commenting on other blogs so I am not sure if I will get to another post or not. I do have a question for you though...afew of your recipes have Wheat Flour in them (I think)...I am not able to find Wheat Flour...but I found Rye Flour...would that work? Or Soy Flour? Also, I will be cleaning out my cabinets tonight...actually rearranging...How twisted is this...I'm actually excited about it! Hi Harmonia, I'm sure the Old El Paso sauce will work just fine too - just adjust the 'heat' to your taste. I know, Jess, cilantro is a love or hate thing (some people think it tastes 'soapy')! Hi Amy! Excellent! So pleased you liked that soup. It is pretty easy, and just so nourishing I find. I will be making the hummus quinoa casserole soon too - haven't had it for a while, and have had a couple of questions about it, so I should pop on a picture. Not hard to make, but you need a couple of cups of hummus for it (basically a full batch from my book). Thanks for the feedback! Hi kaivegan! You know, it was really pretty today because the sun was out and the roads are all clear but there is some snow scattered on the trees. Who am I kidding?! I'm just happy that the sun is out melting it all!! :) Bring on spring, bring on summer! Groan... poor you with that night. I am still breastfeeding the baby too, but she goes through the night so usually we have good nights with the exception of bad dreams for our older girl. I know which recipe you mean... the Sweet Curry Chickpea Casserole - that's great it worked out even with some modifications! You have been cooking/baking so much, and with some sleep deprivation - wow! Harmonia, do you mean my baked goods? Wheat flour is simply regular flour. Unbleached wheat flour is the white flour you find in stores, and whole-wheat flour is the whole-grain alternative to white flour (which is quite processed and refined). Whole-wheat pastry flour may be a little more hard to find, but is made from a softer wheat so it is a nicer texture for certain things like cookies, etc. Rye flour is very strong tasting and will not substitute the best, and I wouldn't recommend soy flour either (can't sub equal parts). You can substitute barley or spelt flours very well - but you should be able to find white or whole-wheat flours fairly easily... or even whole-wheat pastry flour. Does this help? yes, Whole-wheat pastry flour. And yes, it helps a lot. Again, I know nothing about baking or flours. LOL. Thank you for the tips on substituting...I would have been in for quite a surprise! I've been pondering a 2nd blender because I don't always get to wash my first one quick enough. What does the Immersion feature that a normal everyday blender doesn't? How does it differ? No problem, Harmonia. With the immersion blender, you can put it into a tall large cup to quickly whiz up a smoothie, for instance, or directly into a soup to puree it. If you wanted to puree these soups without an immersion blender (also called handblenders), you would have to take it out in batches and puree in a blender (which gets messy and time consuming). This you can stick right in, whiz as much as you like until it's at the consistency you want, then take it out, detach the blender stick from the base and stick it in the dishwasher. Presto! I love mine, use it daily, but I also make smoothies daily, so it's indispensable. Dreena! You're in VegNews magazine! This is my MOST favorite magazine, and I just picked up the latest copy, and there I see your name on the article about spring soups! So exciting! Hi Ms. Mercedes! I was just getting the post ready about my VegNews article when you were adding this comment! I love VegNews too - I'm always excited to pull it out of the mailbox, it's just the best filled with tidbits here and there and really informative and fun stuff! Tabasco Chipotle sauce is the best. You can never have too much of that around. Speaking of which - I'm out! I guess I'll head to the store. I actually did just do your cccookies! I just posted about it on your other entry! Awesome!!! Thanks for the info on the blender. Yeah, I noticed with the blender I have it's great but I haven to add more cooking liquid or water to make it blend nicer!